A few years ago we started a Christmas tradition of gifting the boys new pyjamas when the Kindness Elves left on Christmas eve. Last year I found onesies for both Euan and Luca but this Christmas I struggled to find something suitable for Euan who’s 6. Onesies for older boys seem to be mostly made of fluffy fleece which is fine for snuggly film nights or playing but far too hot for sleeping in. The only cotton onesies I found were branded ones for football fans or much more money than I was prepared to pay for pyjamas. I resolved to stop my on-line search and hit the high street in Gloucester instead. On the last day of term I added ”PJs for boys” to my shopping list and quickly checked my emails before heading out to school. asked The Pyjama Factory in an unexpected email. I hadn’t seen any previous emails. I searched my junk folder and there it was. The last posting day before Christmas was looming and we were about to start the school holidays so I sent a disappointed reply saying ‘thanks but sad to say I can’t write a review at the moment’. ”Don’t worry” came the friendly reply ”We’ll send some pyjamas out today and you can write the review whenever it’s convenient”. How lovely is that, I thought. I quickly scanned The Pyjama Factory website . Searching available stock by size made it much quicker as their range of pyjamas is vast. 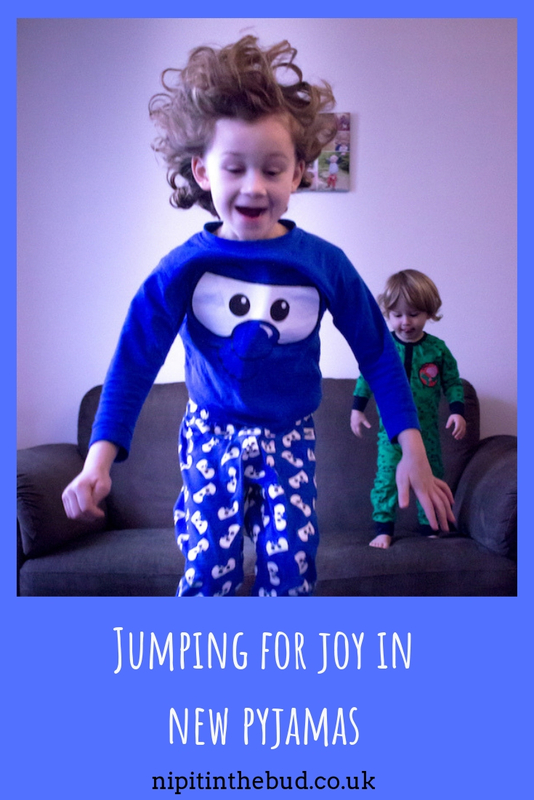 I chose a pair of blue Funny Face pyjamas for Euan age 6 and a George Pig dinosaur onesie for Luca age 2. I wondered as I typed my reply whether a fleecy Penguin onesie for dressing up was an option if I passed on the offer of PJs for me. The Pyjama Factory happily granted my wish and we received our parcel the next day and in time for Christmas eve gifting from the Kindness Elves. This George Pig onesie is 100% cotton. I thought it was a really good price at £8.99 as often the novelty of onesies or branded items adds several pounds to the price tag. It feels soft and is washing well. I like onesies as both my boys have short legs so getting both pyjama tops and bottoms that fit well is rare. The elasticated legs on this onesie mean you can buy the next size up knowing there’s room for growth without trousers falling down. Luca wears size 12-18 month trousers still so I thought this size 2-3 years onesie might be on the large size. It was actually a really great fit. Luca doesn’t like covers when he sleeps so a onesie is the perfect option for him. Luca was a bit reluctant to stand still for photos unlike Euan who is a highly skilled reviewer now. I remembered taking pictures of Euan jumping off the sofa when he was 3 for another review. I decided this would be the best tactic for engaging Luca . It proved effective, albeit impossible to co-ordinate Luca’s jumps with Euan’s 1-2-3-jump calls. The boys had a lot of fun jumping off the sofa and despite Euan’s pyjama bottoms being much too big on him he didn’t quite loose his trousers. I find sizing of PJs tricky for Euan. He’ll turn 7 this week and as you can see the 6-7 years top just fits him (a little short in the arms). I’d normally size up for tops to get more wear out of them but with PJs trousers are always too big. Euan can still fit into age 4-5 years bottoms! He likes these pyjamas enough to tolerate having to keep pulling them up but I will put a couple of stitches either side of the waist so he doesn’t have to worry about it. These Funny Face PJs are also 100% cotton and available in red, yellow and pink too. Luca was a bit jealous of Euan’s pyjamas and wanted a pair too so I’ve had to promise him some for next Christmas. Euan loves this penguin onesie – ”it’s really snuggly Mum, like being wrapped up in a blanket. I just want to curl up with my book now”. 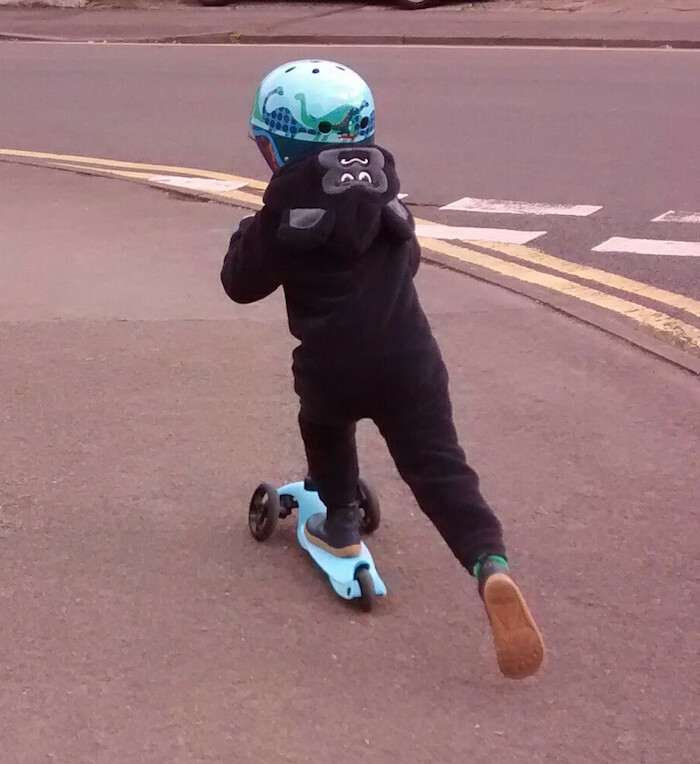 It fits him like a glove which means I wish I’d ordered a 7-8 years so he can enjoy it for longer. I didn’t heed my own upsizing onesie wisdom when I ordered it as I was in pyjama sizing mode for my short legged boy. Oh well, that’s the beauty of having a younger sibling who will get to enjoy it in 4 years time! I think these character onesies are really good for play and dressing up. Euan finds them more comfortable to wear than the thin staticy dressing up costumes you can get A fluffy animal onesie also costs a lot less (this penguin onesie is £10.99). Euan has been known to wear fleecy onesies over his clothes to go to the park (particularly useful if you have a child resistant to wearing a coat). It’s only when people give him encouraging smiles as he scoots by that I realise it’s not that usual to see a scooting gorilla! 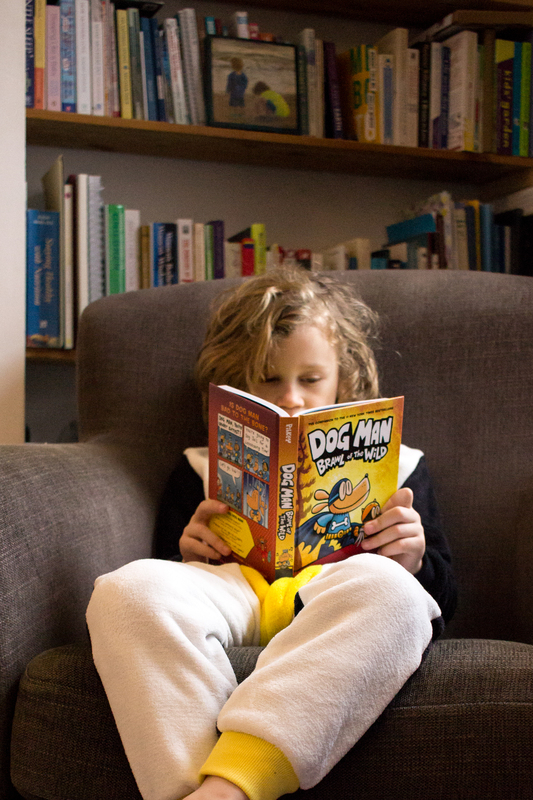 After all the sofa jumping the boys were thirsty and when I came back with drinks … Euan was curled up with his favourite Dogman book feeling really cosy. 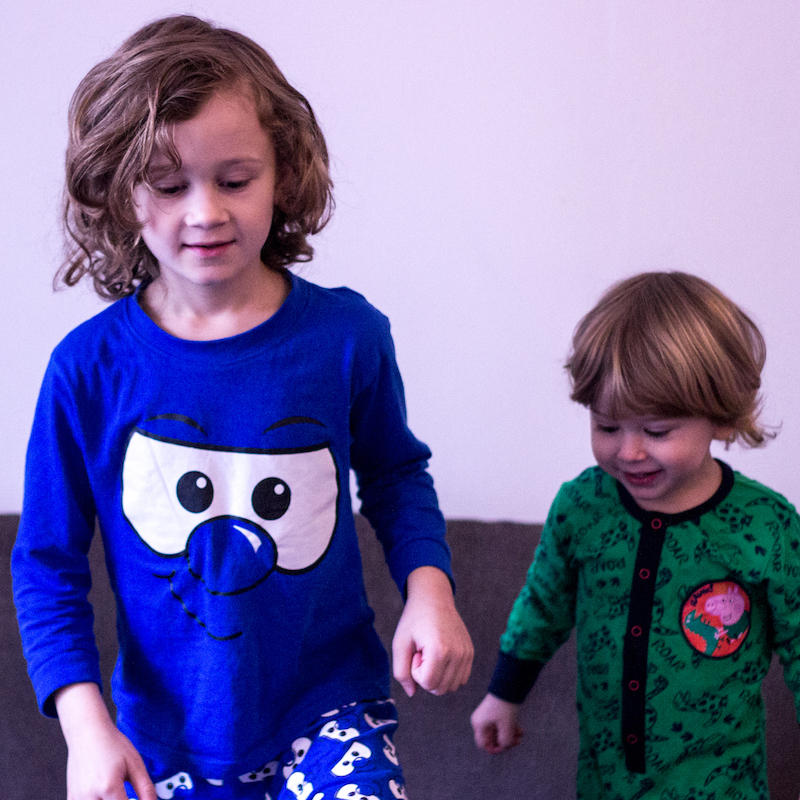 The pyjamas and onesies shown in this review are in stock from The Pyjama Factory website. There is currently a 25% discount available on all purchases for at least the next week (review published 14-1-19). Disclosure: we were sent these pyjamas for the purposes of this review. We were not required to give a positive review and all opinions expressed are my own. 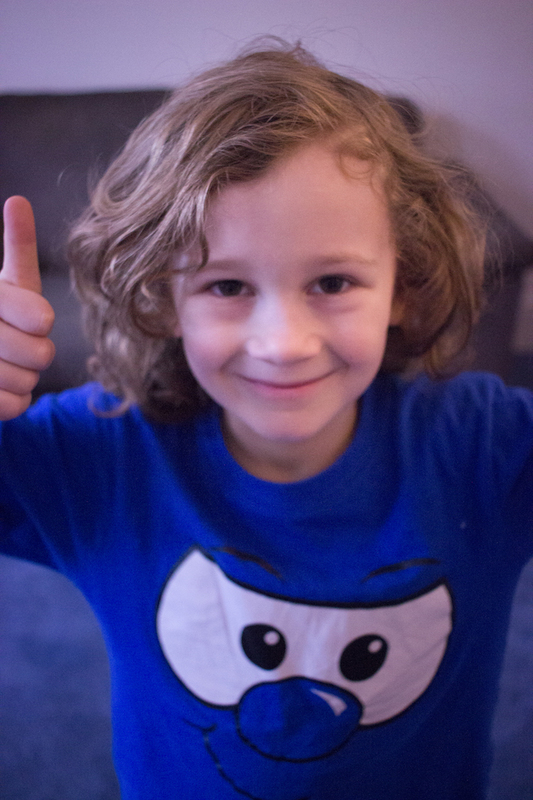 It’s always Euan’s favourite way to start the school holidays – staying in Pyjamas. Love the PJ’s and very reasonably priced too! Thanks for sharing! You can’t beat new pyjamas! I’m a big fan of the new jammies on Christmas Eve, and these look great!